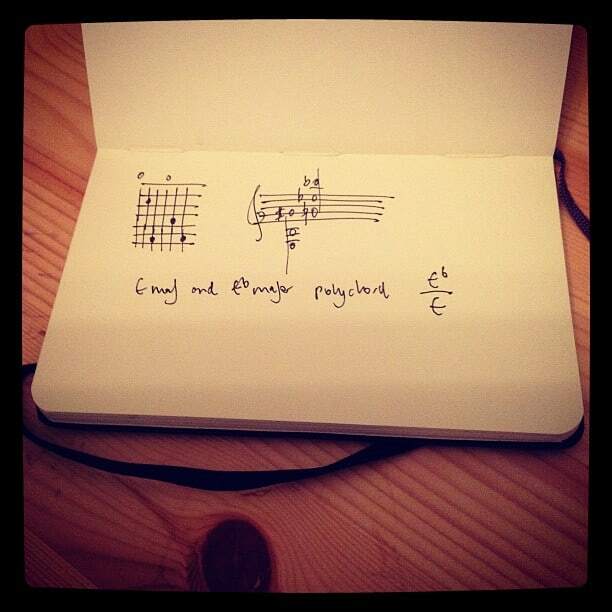 Here’s a polychord of E and Eb major that I’m particularly fond of. RE writing: I use a diagonal line to indicate a slash chord – a triad over a bass note, and a horizontal line to indicate a polychord – one triad over another triad. But if you are after some bitonal nourishment, may I suggest a diet of writing out all the possible major triads over all major triads? So 11 x 12 = 132 possibilities. Scribble them out, or better yet, write them out in a text file and post them to the comments below, and then figure out how to play them on the guitar. You could also do minor triads.